Okay, The Legal Genealogist would like to try to get something across to the family. Really, guys, it’s supposed to work like this: you meet, you fall in love, you marry and you have kids. And it seems that even in my father’s oh-so-rule-abiding German family, I can see an occasional lapse, particularly because it was expensive and sometime difficult to marry in Germany. 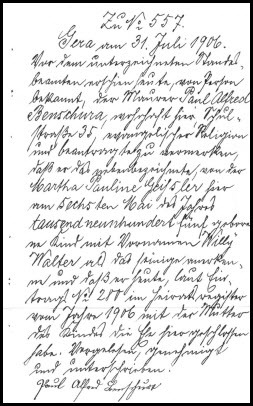 So I can be bitterly disappointed to discover that the only recorded parent of my great grandfather Hermann Geissler when he was baptized in Ossig, Sachsen-Anhalt, Germany, in 1855, was his mother — Friedrike Geissler.2 Not because of any issue with her infidelity — Friedrike did give him a stepfather a few years later3 — but because to this day there’s no record I’ve been able to find of Hermann’s biological father nor of any siblings. So I get it. Sometimes the order is like this: you meet, you fall in love, you fool around, you have a kid — singular — and then you get married. But it looks like one of my German grandfather’s sisters didn’t get that memo either. A fellow genealogist, German researcher Ursula Krause, is rounding up some records and doing some boots-on-the-ground work for me in Germany right now and, yesterday, a document landed in my lap. There’s just one little problem here. But it sure looks like my German grandfather’s sister Martha may come in second in that category. I just wish one of the little bastards would have said something! Image: The marginal note legitimating Willy. So, I’m curious. Why wasn’t Alfred acknowledged when Willy was? Was he NOT the son of the man his mother married? What an engaging way to explain such a sensitive subject, and what a public service to educate those who mistakenly believe that’s this sort of thing only happens in “certain” populations. I was a teenager in the 1960’s when unwed mothers were just beginning to be accepted even though they didn’t keep their babies or they married the father. My parents had very strong opinions about unwed mothers. And when I started doing genealogy I discovered my grandmother had a son 5 years before she married my grandfather. I still don’t know if he was the father. This was all within 15 miles of where I was raised and now 5 miles from my home. I look at every man over 60 to see if there is anything about him that looks like my uncle. In one of the family reunion pictures of all the brothers, that one sticks out like a sore thumb! My guess is that his father was not my grandfather. But I’d sure like to know……Everybody is related to everybody here. Don’t say anything about anybody until you know how they’re related! Unfortunately, his whole branch died out so there is no one to beg DNA from. A German immigrant cousin (1869-1944) was born out of wedlock to a Schaefer ancestor. When he later married in the US, he evidently “invented” a father named Henry Schaefer, as listed in the Iowa marriage records. However, a German Ortssippenbuch (village lineage book compiled from church sources) show his father was “unnamed” and his mother’s surname was Schaefer. Because of his birth circumstances, my great grandfather paid his way to America to give him a better chance in life. On a different American line, two great aunts carefully planted stories in the local Missouri newspapers (1911) that detailed “a clandestine wedding” the year before their little sister gave birth! It was a bit surprising when I sent for the wedding record, and it was a year later than the newspapers reported! I have one of those too, Jim: a cousin who emigrated to the US and gave her grandparents’ names as her parents when she registered for Social Security. Church books proved who her mother was, and that she was unmarried. One of my father’s first cousins was born less than nine months after the marriage of her parents. My second cousin, when informed of the records I had found for the various births, marriages and deaths in that line, believed that there was an error given the too-short time gap. But then he communicated with his aunt, who acknowledged that she was a “love child”, which she had known for quite some time. One of my brother-in-law’s male ancestors on his mother’s side was given the same surname as his unmarried mother, and no father is mentioned on the birth record. She took the secret of that child’s father’s identity to her grave. Another example of “it happens in every family!” for sure. I LOVE your blog… a never ending opportunity to learn AND be entertained. Thanks Judy G. Russell! Aw… thanks so much for the kind words, Karen! Much appreciated! Very interesting post, Judy. Lots of this stuff going around. In my family, too. As far back as I can trace my ancestors, and in the current generation. One of my ggg grandmothers had an out-of-wedlock baby in Schenectady, NY, in 1798. She listed this daughter in her NT with no surname. Some kind soul found the baptismal record for the baby, which listed the father’s name. Since the Dutch still followed the traditional naming patterns, my informant was able to make a pretty good stab at finding which man with that name was the father. A few years later, my ggg grandmother married someone else, and the first child of her marriage was born 6 months later. In my reading on New Netherland, I found a study comparing marriage records and baptismal records for couples around 1800. Conclusion: around 30% of first children in a marriage were born 6 months or less after the parents’ wedding. In some cases, the husband may not have been the real father, but most probably were. Without DNA, impossible at this remove of time to be certain. The study’s authors suggested some reasons, besides the obvious. An important one I hadn’t considered was that New Netherland was still sparsely settled, outside of New Amsterdam. There were few Dutch Reform ministers. The ministers traveled from their own church when they could, held services, and performed the sacraments. These included marriages and baptisms. They didn’t record birth dates in the baptismal records. But given their theology, baptisms were done as soon as logistically possible. Because I had the NT, I knew when each of my ggg grandmother’s children was born. Baptism, more than marriage, apparently mattered in this faith tradition, since my ggg grandparents managed to get their children baptized within two weeks of birth, on average. Down the generations, in my families as in most, out-of-wedlock births pop up (or is it pop out?) now and then. In some cases, marriage followed the birth. In some the baby was adopted out, either in more or less complete secrecy, or in an open adoption. In one case, whether the pregnancy was planned or not (none of my business; I’m not about to ask), a middle aged woman is raising a wonderful, precocious preschooler. I’m glad times have changed, because they’re totally accepted by the larger family. Whether her child will ever be told who the father is, I don’t know. The father’s taking no part at all in raising or financially contributing to his child’s needs. She’s getting a lot of that from the extended family, fortunately. In researching my Norwegian side, I learned that back in the day, penalties for out-of-wedlock births could be extremely severe. Weddings took place after harvest, so many situations like that in New Netherland must have arisen. But for cases where a woman refused to name names, or the couple refused to wed, as late as the 16th and 17th c, one or both could face execution, once the baby was born. Sorry for the long post! Just goes to show how yours hit home. And it’s amazing how much sometimes can be discovered about these issues in the past by a little digging, and then some more digging. Do let us know what Alfred’s birth record shows! Finding out the end of the story is part of the fun. When he retired my uncle decided to work on his family tree. It has exactly 3 people on it!!! He abandoned as soon as he found out he was conceived before the marriage of his parents…. I never can understand people with that reaction. Personally, I love it when I find someone in my tree was just plain human — and my scoundrels are the most fun of all. I have one of these, too, in Bohemia, near the border with Bavaria, in the former Austrian Empire (now the Czech Republic). I’ve wondered in my case, however, and it might be relevant to your case, as well, whether military conscription played a role in the delayed marriage. Few of us start out realizing how common the out-of- and pre-wedlock births were. Glad you found it useful, Jade! Something I just noticed yesterday about one set of 2ggrandparents, he was 18 and she was 24 when they married. So then I looked at the marriage date and 1st birth date and they were only 6 months apart. Not at all uncommon, Lois! I’m a little concerned for future genealogists. In Ohio, when a man adopts the (relinquished) child of an unnamed father, the adoptive father’s name suddenly appears on the child’s birth certificate. This is true even when the child’s family is open about his/her mother’s unwed status at the time of his/her birth. To my knowledge there is nothing on the official document to indicate that the adoptive father is not the child’s birth father. I don’t know whether this has always been the case; I learned of it within the last ten years. I can see some advantages to this but it feels like a deliberate misstatement of the truth. There is a move afoot to allow adoptees access to their original, unchanged birth certificates in many states — including, as of 2015, Ohio. once again a great read! I have been working on my Danish branches, and have found on two (so far) the same thing. A child born to an unwed mother, who met and married a man a year later. Another carries the name of the town he was born in as his surname, because his mother was unwed and no one would “claim” paternity. She didn’t marry until he was 10. When I started working on genealogy, my grand-mother warned me “you’re going to find a lot of premature babies.” She wasn’t joking. We tend to think EVERYTHING is new. Sigh… It’s not. Great post, Judy. I’ve occasionally witnessed the subject of out-of-wedlock births cause some heated arguments in the genealogical community. You approached the topic in your usual well-thought out manner. I’m from the Southern U.S. (I recently moved cross-country to Colorado) and my father was from a rural portion of the South. I’m having a heck of a time understanding if my paternal GGF was born out of wedlock, and have found the prevailing thoughts in the region have made my research a bit more cumbersome. Building on the joke you included of multiple children born to an unmarried couple, I have to add my own maternal grandparents. I was born in the late 1970s and never met my maternal grandfather, but I’ve heard the following story many times and have the document to prove it. In 1972, my mother and her 4 living siblings were asked by my grandparents to go with them to the courthouse. They agreed, but didn’t know why until they got there. When my aunt asked why the whole family was going to the courthouse, my grandfather announced that it was so the kids could see their parents marry. Naturally, all five of them were astounded because it was 1972 and they were all born in the 1940s. They had always seen what a loving relationship their parents had and never had any reason to think they weren’t married. When my mom, aunts, and uncles exclaimed that they couldn’t believe that their parents weren’t married, my grandfather, the jokester, said, “I figured it was finally time to make an honest woman out of her!” I’m certain that they were finally taking the step because they were both approaching their 70s and didn’t want the other to face any added red tape in claiming life insurance, pensions, etc. It was fortunate because my grandfather passed away two years later in 1974 and my grandmother in 1978 when I was a baby. For them, it was a piece of paper that they couldn’t afford early on. That’s a wonderful story, Betty, and it proves there’s often a lot of truth in those old jokes!